A Sealed Spherical Roller Bearings (SSRB) and Taconite seal solution supplied by SKF Authorised Distributor, Bearing Services Polokwane, to protect a tail end pulley operating in a severely contaminated area, has improved reliability and increased uptime for a platinum mine in Limpopo. Frequent spillages were contaminating the bearings on the tail end bearing assemblies compromising the reliability of the tail end pulley and leading to unwanted downtime for the mine. SKF identified a suitable solution and together with Bearing Services Polokwane approached the mine. “The SSRB and Taconite combination presented the best solution for the conveyor challenge,” says Marchant Taylor, SKF Regional Sales Manager – North East Region. He explains why it is the ultimate sealing arrangement to protect bearings from contamination in highly contaminated areas typically found in mining environments where water wash down is also required. 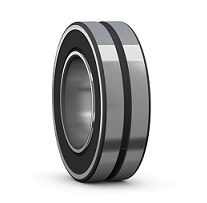 “The SSRB and the Taconite seal are unique in the sense that they offer three barriers through which contamination must penetrate before it will reach and subsequently affect the bearing.” The triple-barrier sealing solution has inner seal protection from the sealed spherical roller bearing itself which is installed in a housing with a 70 to 90% grease fill that completely isolates it from the sealed bearing to form the second barrier. The housing is sealed from outside contamination using a Taconite multi-stage labyrinth cartridge seal which has its own grease filled sealing configuration forms the third barrier. A sealed-for-life bearing is also included. The scope of supply from Bearing Services Polokwane included the supply of two sets of Housings complete with BS2 – 2226 Sealed Spherical Roller Bearings (SSRB) and Taconite seals. Taylor confirms that based on the success of the solution offered by SKF, the customer ordered more sets for similar applications. SKF was able to deliver the total solution required by the customer. In addition to providing guidance on mounting procedures of the SSRBs as specifically requested by the mine, SKF also supplied the necessary maintenance products. The installation of the bearings was supervised by an SKF engineer and the mine received on-site technical assistance from SKF and Bearing Services Polokwane during commissioning. “We partner with our customers, providing effective solutions that protect the reliability of their assets and sharing our application knowledge and engineering expertise,” notes Taylor. “We work in close collaboration with our Authorised Distributors, offering them complete product, engineering and service support. The tail end pulley solution has earned SKF tremendous credibility with the mining customer and Taylor confirms that they see further opportunities where they can assist the mine in overcoming other challenges. “We continue to work with Bearing Services Polokwane to investigate optimum and sustainable solutions for our valued customer,” concludes Taylor.